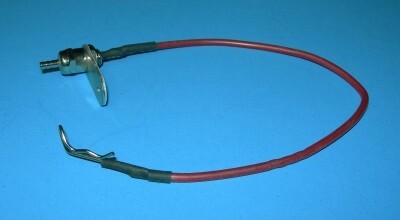 Glow plug cord, Locks onto any standard or 4 cycle plug. Add power panel connectors, connect to 1.5v starting battery or solder to your driver battery. Glow plug cord extra long with 3" of reach. Locks onto any standard or 4 cycle plug. Add power panel connectors, connect to 1.5v starting battery or solder to your driver battery. 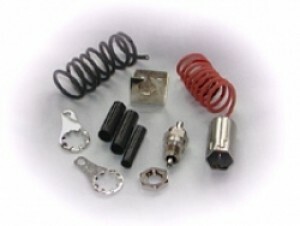 Parts kit you need to power your glow plug remotely. Special fitting twist-locks onto your plug. Mount the "simulated" plug and bracket anywhere you find it easy to reach. Your glow battery will clip onto it just like it was the real plug. Yet, fingers are safe and the port is hidden where you want it. Standard size kit with 5/8" reach glow plug adapter. Long reach kit with 1" reach glow plug adapter. A must for cowled engines, helicopters, & general safety by avoiding the fast turning propeller. Each kit includes a glow plug connector, a ground wire, and a dummy plug for remote power connection. Normally about 1/16" of boot must be trimmed off so the boot sets on top of the hex, not pressed over it. Wire springs backward, a tooth inside locks onto the groove in the tip of the plug. Smooth tip plugs like McCoy's, use the McDaniel product. 5/8" Glow plug adapter head only. 5/8" long. Hooks onto glow plug just like a Ni-Starter does. Comes with 12" red Teflon wire. Use this hard to find part to build your own remote glow plug adapter setup. 1" Glow plug adapter head only. 1" long. Hooks onto glow plug just like a Ni-Starter does. Comes with 12" red Teflon wire. 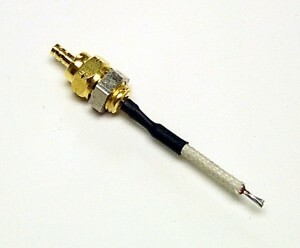 Remote glow plug pigtail and connector. Add a scale touch to your plane! This glow plug connector has a rubber boot and fits all 2C & 4C glow plugs. Comes with 20" lead. Emulates glow plug, allows mounting in a 1/4" hole through a body or flange. Use as part of a system to ignight your glow plug(s) remotely. 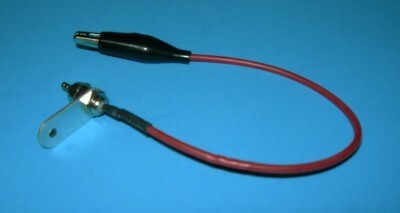 This is the original Cox glow head clip with wires. Fits Cox .049 glow heads and others. These are difficult to find now and collectable. They are also very practical and useful! We have a limited supply on hand. Get one while they last! Priced each, in a plastic bubble pack on Cox display card. For about the cost of 1 glow plug, you can keep your good used ones protected and organized so you can find it when you need it. Loose plugs rolling around in your field box can accumulate dirt and grit, when you later use the plug you introduce this trash to the inside of your engine. This caddy stores up to 9 glow plugs. Injection molded from a brightly colored sturdy rubber like plastic material. The CADDY measures only 2" x 3" and does a big job for you. Connects your power panel or other glow driver directly to your glow plug for starting purposes. Accepts your glow driver and allows mounting the access point in a safer or more convenient location. May be mounted under motor mount lug. If mounted away from motor, a ground wire must be fashioned to run from a motor mount bolt to the mounting tab of the remote glow fitting. Save your fingers. Special Wire Clip attaches to tip of glow plug. Accepts your glow driver and allows mounting the access point in a safer or more convenient location. May be mounted under motor mount lug. If mounted away from motor, a ground wire must be fashioned to run from a motor mount bolt to the mounting tab of the remote glow fitting. Save your fingers. This unit includes alligator clip to attach to engine glow plug tip.